NOTE! Make sure the date matches your local format. Where Account1 is identical to the synthetic symbol that generates dividends (you'll create its fake price history in ASCII file in Step 2). Multiple accounts should be supported: just put there Account2, Account10 etc. Positive numbers will deposit funds to the equity curve and negative withdraw from it. The dates of dividends (deposits) must be real and not fall on weekends or holidays. The file can be edited on the fly to experiment with its effect on backtests. Create synthetic symbol that generates "dividends"
Step on your backtested symbol and run this code: Export2ASCII. Your resulting file should be saved as Account1.csv (or txt). Open the resulting CSV file in Excel and leave only two columns: Date and Close. Leave Dates as is. The crucial step is to replace all Close prices with some little value like "1". The less the dummy price the less is its impact on the actual backtest performance. Now create a new ASCII DataSet, make sure the symbol is named exactly Account1 or whatever name you used in AccountTransfers.txt. In Wealth-Lab's Preferences, change the "Dividend Fundamental Item" to Transfer. This is the special item created by the Transfer fundamental provider (part of MS123 Extra Fundamental/News providers). The idea is to "trade" the dividend-generating symbol Account1 as an external symbol using SetContext() with 1 share. This tells Wealth-Lab to apply the history of transfers to (or from) your account as "big dividends". Failure to buy exactly 1 share would totally distort and inflate backtest results by duplicating (triplicating etc) the numbers. Failure to buy any shares will effectively turn the synthetic "dividends" off. As trading the other, real instruments is usually not performed with 1 share - rather with percent equity - the only position sizing method applicable out of the box is the Position Options PosSizer. It has basic means to assign a percentage of equity to each trade via WealthScript code. You will assign an insignificant percent enough to buy only 1 share of Account1 and use your normal figure for the other trades. At some later time we may be able to come up with a more flexible solution. 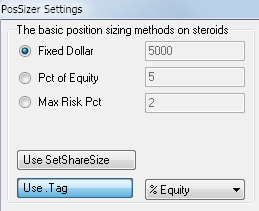 Firstly, configure the PosSizer to Use Tag: "% Equity". These "LastPosition.Tag..." lines connect the strategy with the PosSizer, telling it to purchase exactly 1 stock of your Account1 symbols and whatever percentage of equity you like for the other symbols. Play with the .Tag value for Account1 until it buys exactly 1 share. // Buy the smallest amount possible. Adjust to your equity. // 0.01 means 0.01% equity. You need to make it buy exactly 1 share. 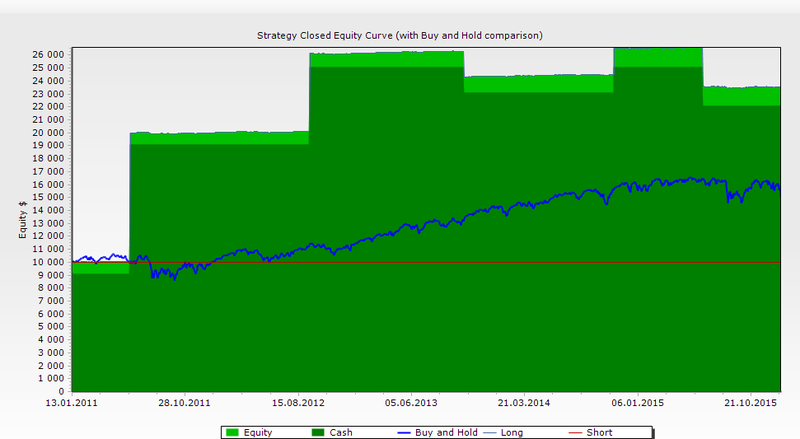 Caution: since Wealth-Lab includes dividends in the trading P&L, it distorts the results.